=> how to set this ? + all relevant common setup tips. 1) We don't reproduce this behavior. Can you give us more information? Which OS are you using? What are the files created in this new workspace? 2) If you have the libwebkit it should be OK. Check the Linux requirements . 3) Do you have problems with LibreOffice or OpenOffice? What kind of problems are you encoutering? If you check the Linux requirements (on point 2) your setup should be OK.
Modelio unzipped in home directory and run from there. 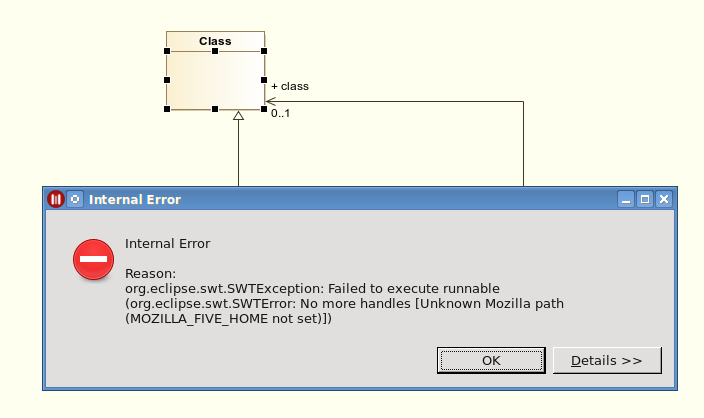 See error dialogue as attached image. text edit fields are disabled. Do you have the libwebkit installed in your system? I did NOT have it installed. for which many different versions and Debian packages exist. restarted Modelio, but the same error remained. Next, I installed "libwebkitgtk-3.0-0" and nothing changed. Finally, the package "libwebkitgtk-1.0-0" was installed by me. and all still works fine. The dialogue is shown. the "Close" button is not shown anymore. Possibly, this is a libwebkit problem. for Linux? Also, which libwebkit API version Modelio is using.